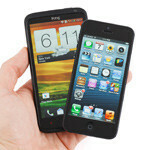 The HTC One X+ is shaping to be one of Android's battleships this season, thanks to its sped-up quad-core procesor and 64 GB of storage, so as always we are pitting it against the iOS flagship, Apple's iPhone 5. 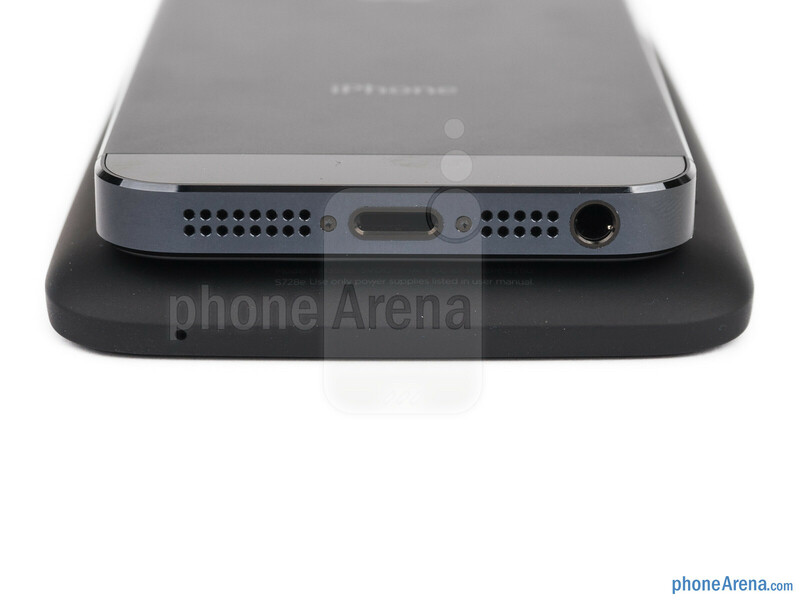 Actually the sealed chassis and rounded corners are the only things in common between the designs of the two phones. The OneX+ rocks a slightly convex polycarbonate body that fits very well in the palm, aiding the grip with its soft-touch finish, just like its chassis twin, the One X before it. 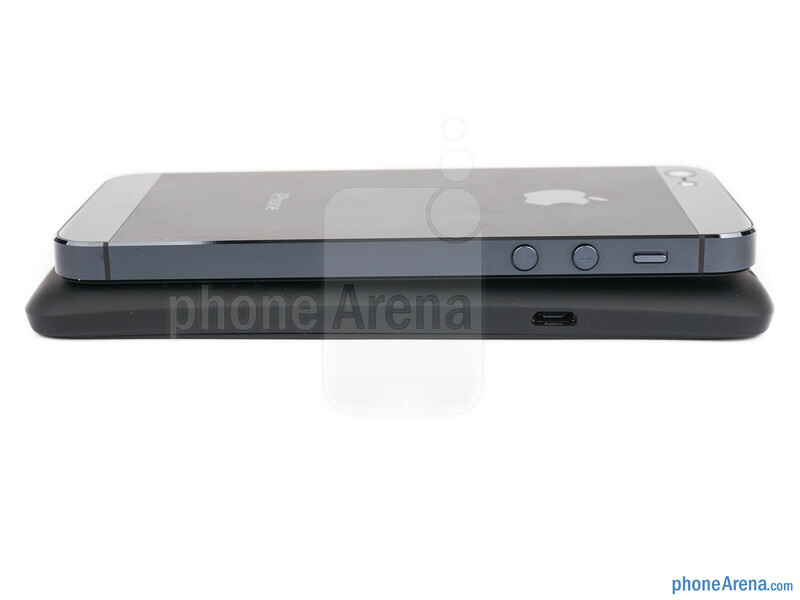 The iPhone 5 is much smaller and easier to operate with one hand, so it dares to be edgier, with clean cut lines, made of metal and glass. 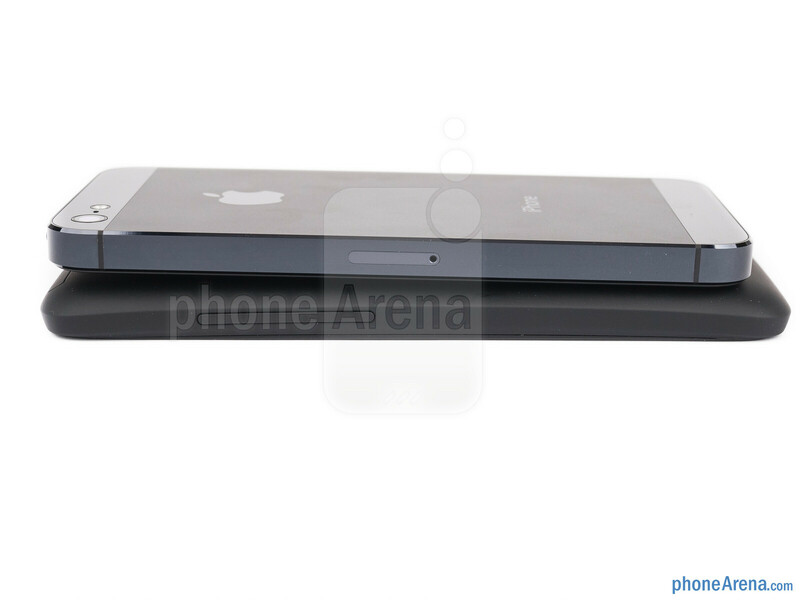 It is incredibly light for the premium materials that build it, and also very thin. Both companies have made a name for themselves in designing their handsets, but these days the shapes of the chassis and choice of materials are dictated by the obligatory huge screen any self-respecting Android high-end has to rock, and you can't really slap much premium material around a 4.7” screen without making the phone pretty heavy. 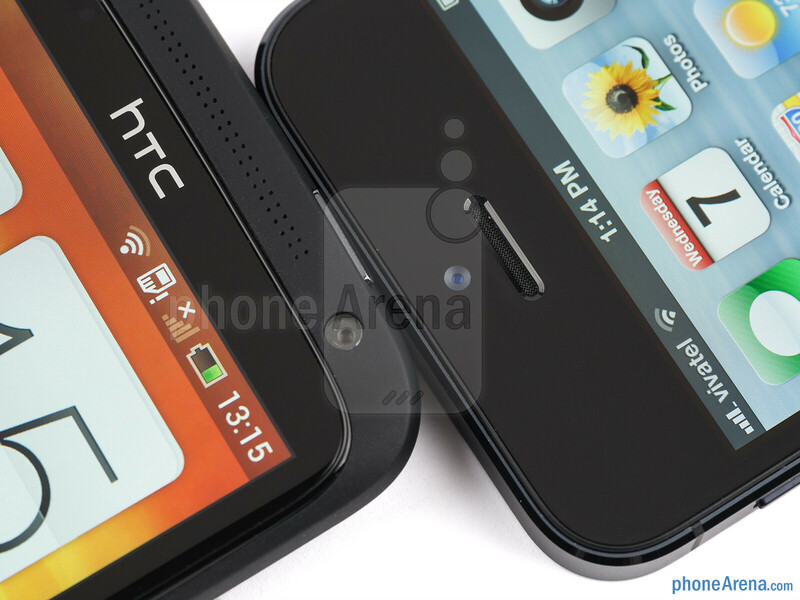 The HTC One X+ S-LCD 2 display is with 1280x720 pixels of resolution, netting 312ppi density. 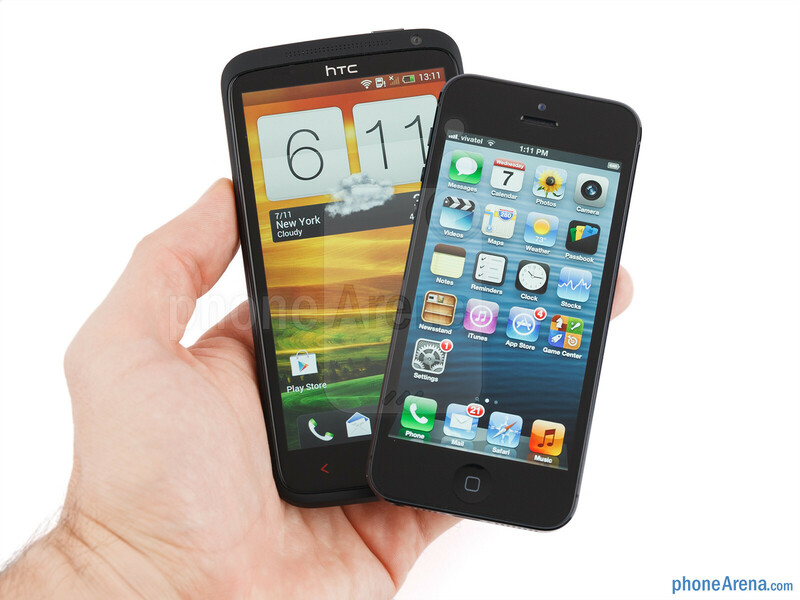 At 4” size, the iPhone 5's in-cell touch IPS-LCD screen is much smaller than the 4.7-incher, and its 1136x640 pixels grace it with the pretty high 326ppi. Pixel density is therefore not an issue for both screens, text appears crisp everywhere, and there are no icon jaggies. When it comes to color representation, the iPhone 5 has one of the most accurate display of all phones, while the One X+ panel seems to go a tad on the undersaturated side. The iPhone's display is also brighter and with a very low reflectance, ensuring a win in the outdoor visibility department. The One X+ screen is sufficiently bright and very good outside, too, so you won't have trouble with both handsets, even under direct sunlight. The viewing angles seem equally good, and the contrast ratios are pretty high for the LCD screens, so overall we have two great displays on both devices. What else can be expected form Daniel P? 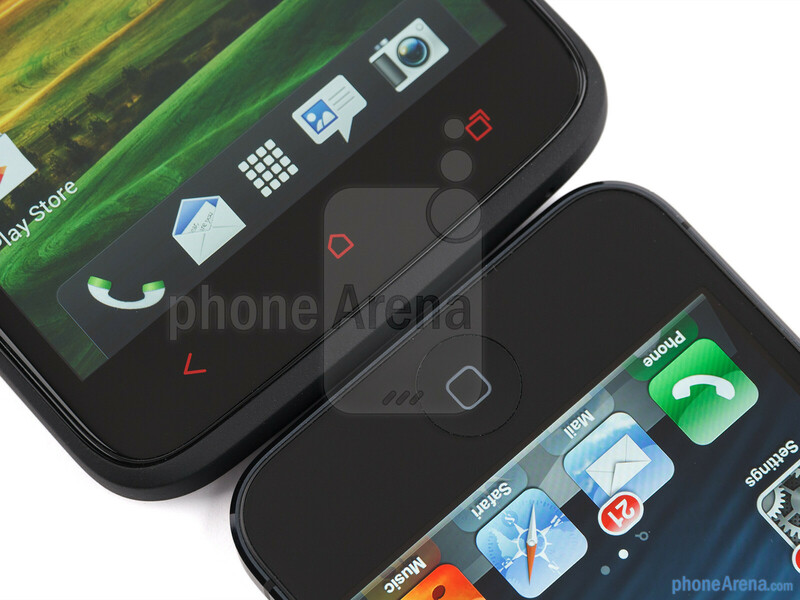 As always a pathetic and biased comparison by Iphonearena!!! LOL another "draw" for the scratchy phone with 5 year old OS. and iPhone falls by the wayside. 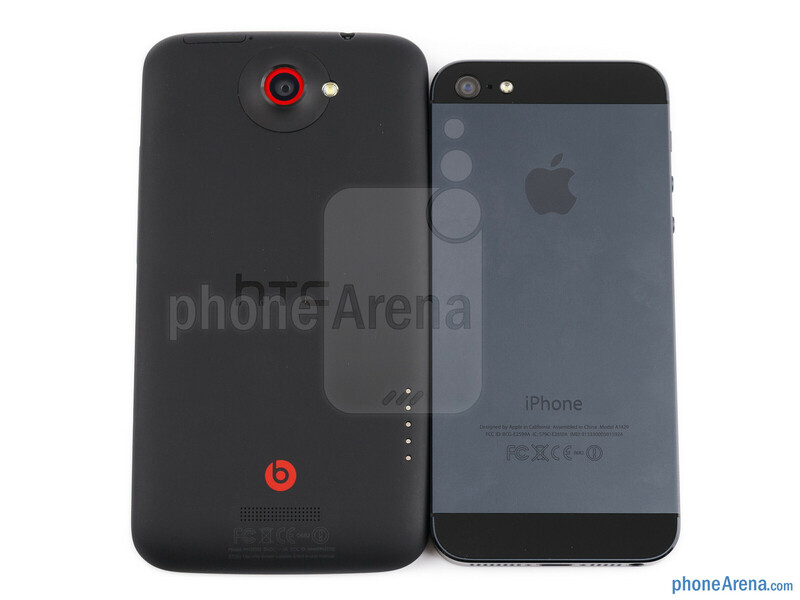 Anytime, anywhere, anyplace, any-year, any country...i'll take the HOX+ over the iP5. any planet.. any galaxy.. any universe.. any life.. notice that compared to the SGS3, the HOX+ is also beaten in terms of camera quality and more or less wins in other categories.. And compared to the iPhone, it loses in that area, too.. So if the camera is better, I'm sure the HOX+ will be so much win..
Oh man , the camera on the HTC has 10x more functionality and feature rich...and something was off on some of those comparison photos...the distances were off on one anyway, it looked like the i5 was zoomed in closer?? AND he failed to mention that HTC device can equally have photos saved to a 'cloud' service (G+)! Be honest dude! 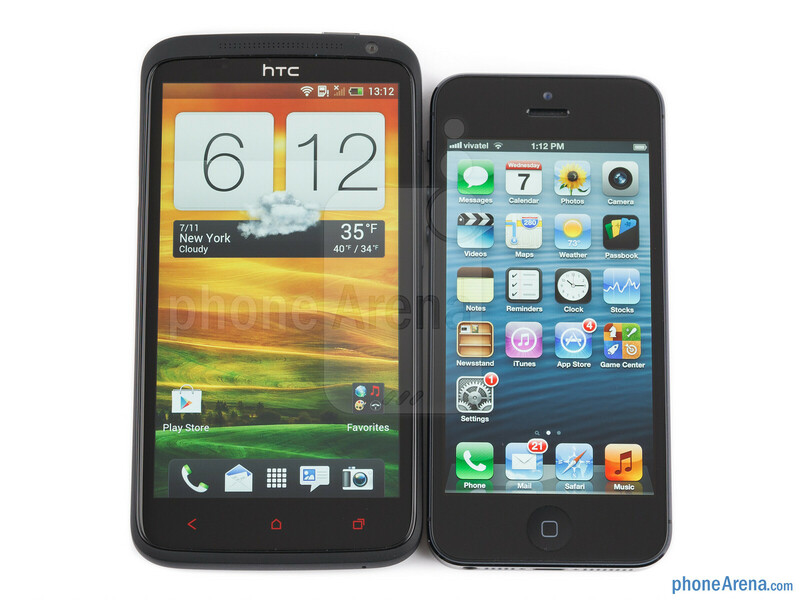 :P Even I'm an HTC One X user and I've used iPhone 4 as well.. 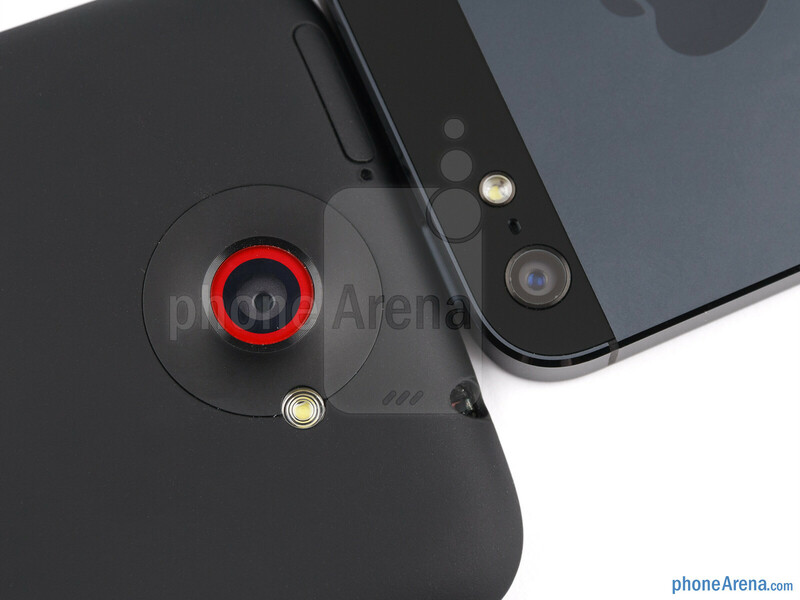 Though the phone is very good, its camera even when compared to the i4, isn't that better! i trust that iphone 5 is very very good phone but one x+ is unique .. every advantages that i think about it Provided in this.. most advantage & one of the all is build quality in one x+ that iphone has a flaw of this .. the iphone 5 s body is Scratchable & dont give me a sense of confidence .. both phone have the best screen amoung the smartphones.. both phone are The strongest & i think 0ne x+ is most beautifull even in interface with sense4+. is this comparison even necessary...? 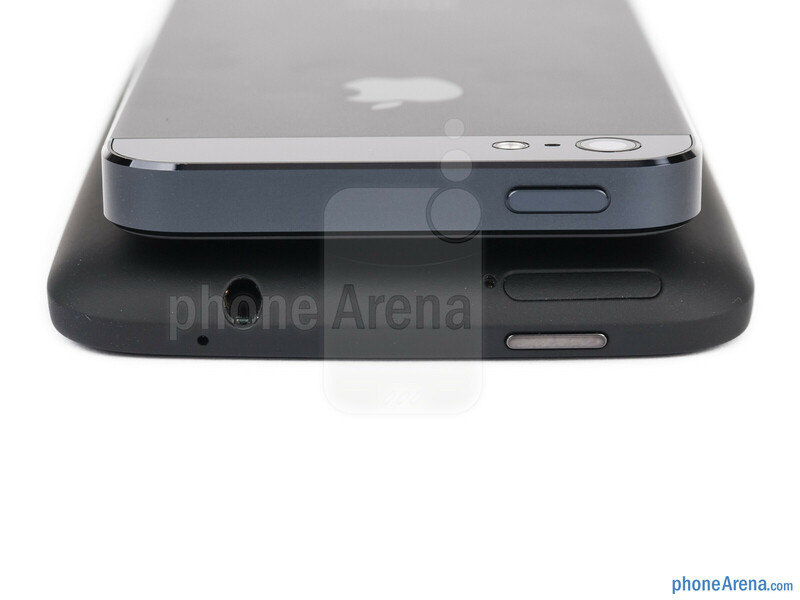 we all know what is better..the one x+ ...and also we all know wat the iphonearena is going to say...jokers of the whole internet..the PA crew that is .! and yet you still read the articles from those whom you called "the jokers of the internet".. Not that I am a fan of iPhone and happy to see PA still gives some sympathy for it (I'm HTC Elevate member, so you know which brand I like), but...... Have some respect for the contributors, please..
i read PA just for fun. to see the comments mainly. when it comes to reviews about phones i basically rely on what the users have to say & user rating rather than what PA says. anyway..u got a point. was bit too harsh, what i posted earlier. but you really cant just ignore how biased & sometimes hilariously so..some of their reviews are. Understand very much that some of their reviews are somewhat biased, especially for the iPhone.. It's okay to comment that the reviews are bad and biased, but just don't call names.. :) Anyway, no hard feelings, bro..
iPhone 5, not so sure.. but read again the articles.. It says it has some difficulties.. and if your iPad can't, most probably the iP5 won't be able to do the same.. I can even play 1080p MKV file on my almost-two-year-old Desire S, although it's glitchy, but I do get sound and image.. Just because it still have two years old GPU and a single core CPU.. So naturally, it can only play 720p videos.. 1080p can be played, but laggy.. most of dual core android can play 1080p, so about the current high ends, don't need to even ask..
One X+ is obviously the winner! at this point in time, comparisons between heavy weight mammoths like one x+ with flimsy fruit seems really dated.